Just thought I'd share some updated baby room pics. Everything is finished in there for the time being. Now we just need a little person to go in there! We are really happy with how it has turned out and think it's pretty cool for either a boy or a girl. Had a nice day resting today - really want to shake this cold before it gets any worse. Anyway, I'm off to have some tea and veg out some more. Hope you enjoyed the two clips below - you need to watch the Nessum Dorma one first then the semi-finals one. I really love opera - bet you didn't know that about me!! 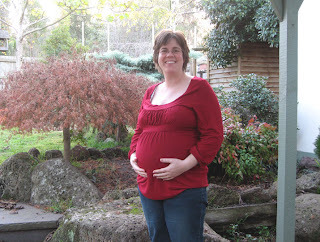 I'm still pregnant - only 3 weeks till our due date now. We had the car seat installed today. Very weird driving around in a car with a baby seat in it. I really want to meet this little person - I am starting to have real trouble sleeping - it's getting harder and harder to find a comfortable position to lie in. And to make matters harder, I'm coming down with a cold so i'm feeling very stuffy in the head and nose. But the end is nigh! I've only got 8 days of work left so I'm really looking forward to being lazy after that for a little bit. Things are definitely getting close. We have our last ante-natal class tonight so that should be fun. My bag is all packed for the hospital - just in case! 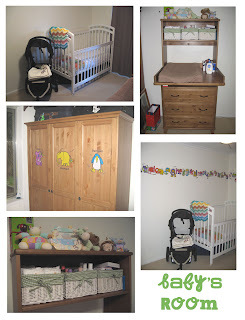 The nursery is pretty much done - I'll take some pics tomorrow when it's a bit lighter and share them with you. It's all getting very real and also surreal all at the same time!! Is that possible? Anyway, I'll be back with some pics to share soon. He won the Semi-Final and this is his second performance. THis guy totally makes me believe that dreams really do come true. Everything is going really well. I'm still suffering some back and pelvis pain but am not complaining. It's amazing what a heat/wheat pack can do! There's been some exciting things happening around here. First of all we got a new car!! FINALLY! We are now a 2 car family again. It's been almost 2 years since my little red Ruby went to heaven so we've done well to last that long. 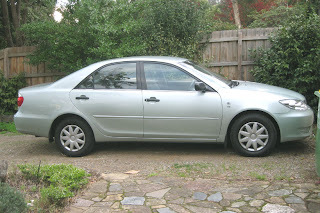 The new one is a 2004 Camry Altise and we just love it. It's so quiet to drive. We are in auto heaven. We just desperately needed a reliable car for when the baby comes along. I had my baby shower on the weekend. I had an absolute ball. My mum and sisters put it together for me and I love them so much for that. It was so nice to have my family and girlfriends around me, laughing and eating together and having a good time. Got some really nice pressies too. 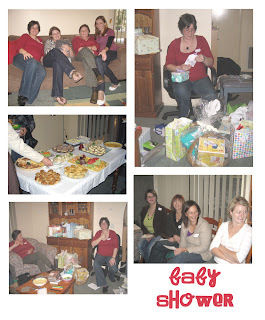 I was so spoilt - well I should say the baby was so spoilt!! I don't think I'll have to buy any wipes or lotions for awhile! I think we are almost organised for this little one. The nursery is almost done -need to get some curtains, some cot sheets and a little lamp for feeding and then that's about it. My hospital bags are just about packed. Just a few last minute things that will need to go in once the process is underway. It's all getting a little close now. We are hoping to finish setting everything up over the long weekend so I will post some pics once it's all ready to go. Thought it was time I shared my bump. I've included a covered and uncovered pic. Hope you aren't all disgusted by the bare skin!! It's not a huge bump but I'm happy with it. What do you think we are having - boy or girl? I have no idea. Anyway, Andrew just made me some tea and it smells good so I'm off to eat. 5. A night at home watching Desperate Housewives!